The only things that marred the Ducks’ decisive win over Portland State last Saturday were a blocked extra point, a roughing the kicker penalty, a face mask penalty, a roughing the passer penalty and for the second straight game, a substitution penalty which was blamed on the coaching staff. Otherwise, it was a country whupping and the Vikings were never in the game as they chose to keep their No. 1 quarterback out, and predominantly ran the ball to take as much time off the play clock as they could before snapping the ball on offense. One couldn’t blame them because this was not a fair fight. Portland State had a combination of 57 freshmen, redshirt freshmen and sophomores on their 93-man squad. Except for penalties that could have been avoided, the Oregon offense started fast, scoring on five of six first-half drives. The defense held PSU in check, giving up three pass plays — two of which went for touchdowns. No one has run for a touchdown yet on the Duck defense. Justin Herbert throws perfect pass slightly away from outside defender to hole between him and the inside defender. Dillon Mitchell (above) needs to turn slightly inside to catch the ball in the open window, has his hands on the ball and drops it. NFL scouts will give him a bad mark for that drop; he should have been able to show up in the open window and catch it with his fingertips. Johnny Johnson III tries to cross hand catch a Herbert pass (above) and drops it, the second straight pass dropped by Duck receivers on Herbert’s first two attempts in the game. Johnson doesn’t have his thumbs and forefingers together and may have had more strength in the catch if he caught in a cradle with the edges of the palms together. This is an example (above) of a quarterback panicking and running out of the pocket when he could’ve had a better chance stepping up in his protection. By going outside, he nullifies any chance his linemen had of protecting him longer. Watch how Herbert, (above) by calmly stepping up in his protection, easily sidesteps an outside rusher who was unblocked. By stepping up, Herbert uses the out-of-control speed of the rusher against him. Herbert’s footwork has improved tremendously since his “dancing feet” days as a freshman. In experienced Viking offensive line is outmatched (above) by Oregon’s NFL prospects Jalen Jelks (No. 97) and Justin Hollins (No. 11) on this pass play. Portland State’s left tackle has no chance or quickness to slow Hollins off the edge and Jelks demonstrates great defensive line handwork in getting rid of the center and guard’s attempt to block him as he literally runs over them. The Ducks were able to get a sack with only a three-man rush against five offensive blockers, something they may not be able to count on after the San Jose State game. 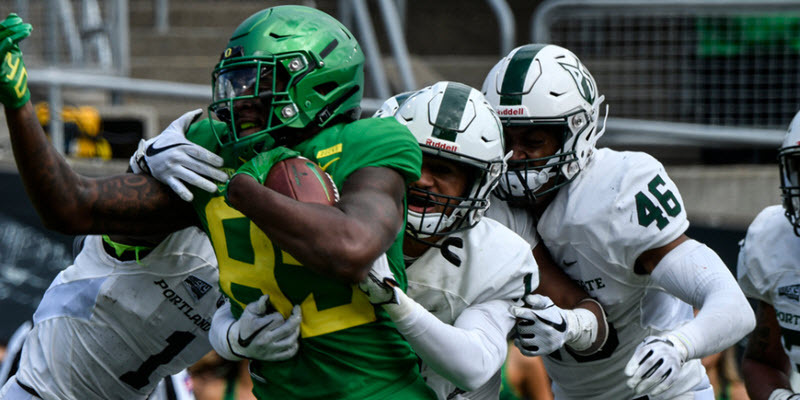 This week, the Ducks take on San Jose State, an 0-2 team that is capable, perhaps, of putting up a better fight than Portland State, particularly through the air. As in the previous two games, Oregon is heavily favored. Coach Mario Cristobal wants to see a fast start and a killer instinct from his offense and not have the defense get fooled by any trick plays. You will probably still see a lot of young, new faces getting some action as a prelude to when things get serious the following week against Stanford. Saturday, look for all the elements of a disciplined football team: no penalties, no turnovers and no missed tackles. Cristobal has set a high bar for his squad, and has his team believing that’s the only way they will be successful this season. So far, that’s been fairly evident from the press box and apparent in the Ducks’ first two games.